Precise methods are often needed to characterize habitat use by fishes, especially for litigation and detailed habitat modelling. Pre-positioned areal electrofishing devices (PAEDs) have been developed to survey stream fishes and develop habitat suitability criteria. PAEDs, which consist of a shore-based generator and a submerged electrical grid, are less intrusive than other electrofishing methods and result in little to no fright bias, i.e., flight response, in fishes from the electrical stimuli. Standard practice allots eleven minutes post- implementation of the devices to allow fishes to recolonize the area. Thus, these low-cost apparatuses can sample distinct areas of stream reaches to assess the microhabitat of fishes. Challenges to using PAEDs include speed of deployment and difficulty of their transport to remote areas. Here we compare various forms of PAEDs to establish a technique for effective fish sampling at remote sites that considers fright bias, fish mortality, and the size of the electrical field. A digital multimeter and underwater videography were used to assess the electrical fields of various PAED designs and the fright bias induced by different techniques. We found that modified 8 PAEDs connected directly to a boat-mounted AC power source were sufficient for sampling desert fishes without inducing mortality or fright bias. Also, neither using two devices simultaneously nor using a 30-m extension cord affected voltage near the electrodes. 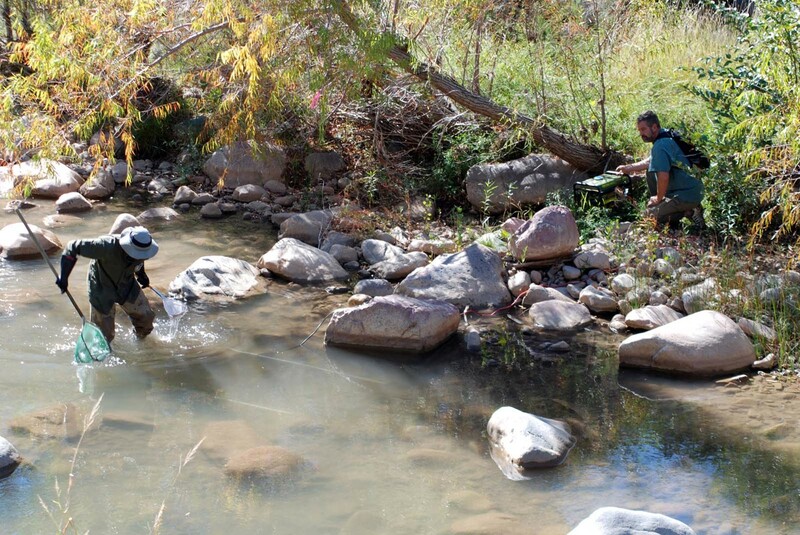 This study demonstrated effective ways that PAEDs can be used to sample stream fishes in remote areas when collecting microhabitat parameters. Field work on this project was conducted Fall, 2016, and results were used to inform sampling conducted during the 2017 season. Partners include USFWS and USFS.